With the volume of hops I've been growing these days, I've long been needing a better system for dehydrating larger volumes of freshly picked hops. According to Wikipedia, freshly picked hops can have a moisture content of 80%. Prior to modern methods of dehydrating and making pellet hops, growers built a hop oast house to remove moisture from whole hops. The purpose of the oast was to take the moisture content down to about 6%. 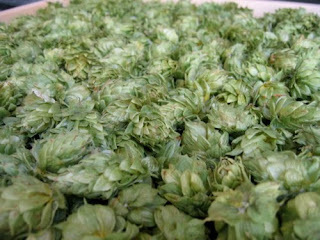 Without dehydrating, hops can quickly turn brown and eventually spoil. You could potentially refrigerate or freeze wet hops but the moisture content can significantly shorten storage longevity. 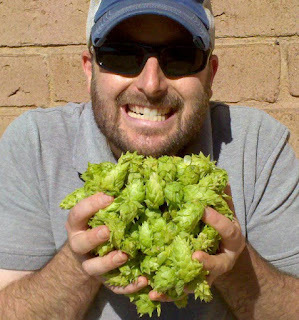 Some like to use wet hops for brewing or dry-hopping but I find this imparts vegetable-like flavors and aromas. 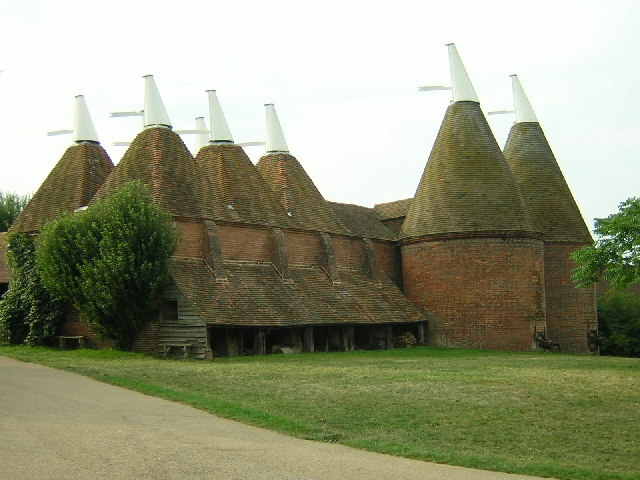 Oast houses had several perforated floors where hops were spread out. At the bottom of the oast house was a kiln that applied heat through the hop laden floors. Moisture escaped out those chimney-like rooftops. 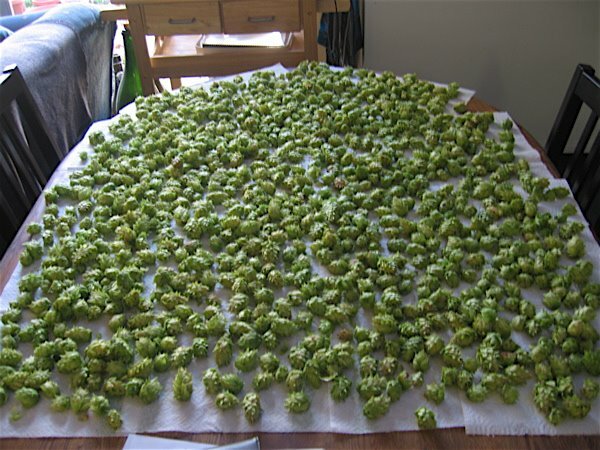 Ever since I've been growing hops, I used a common household dehydrator to do the bulk of the work. Unfortunately, I could only dehydrate 4 square feet of hops at a time. Considering the volume that we have typically picked off the vines at our hop farm, this simply was not enough space. Former household dehydrator used to dry hops. Every time we picked hops, it was always enough to fill two of these dehydrators. We only have one! The excess was spread out on a table at our apartment or house on paper towels. We also turned on a fan to keep the air moving across the surface of the table. When the hops were finished in the dehydrator (typically about 48 hours), we would transfer the table hops to the dehydrator to finish them (another 24 hours). Dehydrating hops on a table in our old apartment. Obviously this method of drying hops, though doable, wasn't very practical. It limited us to how much hops we can truly pick, lengthened the time and work needed, consumed living space, and overall unchillindamos. It did, however, make the house very aromatic. If you want to live in an IPA, this is the way to do it! 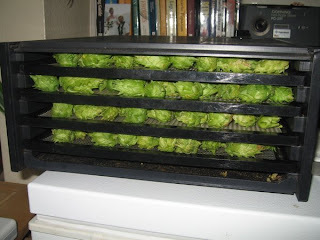 The idea for the new Dehydrating-damos Hop Oast came from Food Network's show "Good Eats" hosted by Alton Brown. The segment on the show is embedded below for you to see. 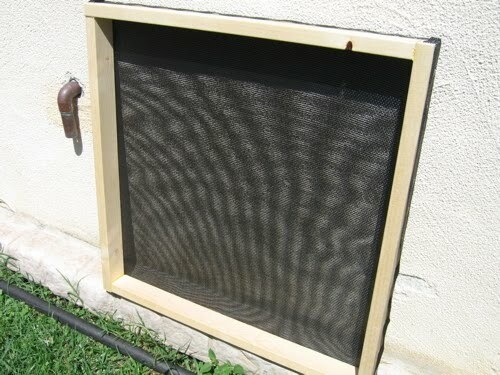 Basically, he uses common household furnace filters and a box fan to dehydrate meat and make beef jerky. Last year, I acquired a box fan that a friend was planning on getting rid of with the intention of building a similar dehydrator for hops, the Chillindamos Dehydrating-damos Hop Oast. The newly built oast hop tray frame. I purchased some nicer lumber that has been sanded and has round edges (let me know if anyone wants specifics here). Round edges make it easier when stretching the screen material. I sized pieces to the box fan's dimensions. 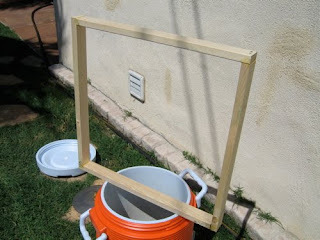 Hop oast tray frame, simple construction. There's no need to do anything fancy. The frame for each of the hop oast trays were built using a hand saw, nails, and wood glue. Screen material stapled to the hop oast tray frame. In the screen door section of the hardware store I found this heavy duty plastic-like screening that would work just right. I used a staple gun with 1/4" staples. 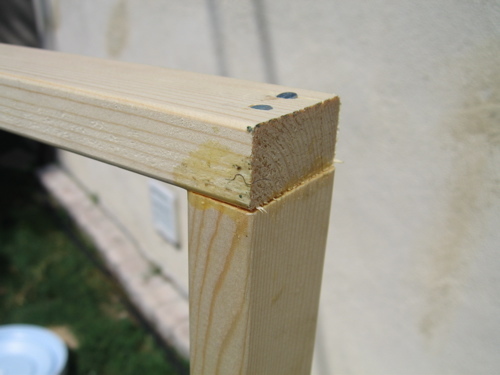 Screening material stretched and stapled on the sides of the oast tray frame. The trick to a nice taut screen is to start in the center and work your way to the corners, rotating sides each time. 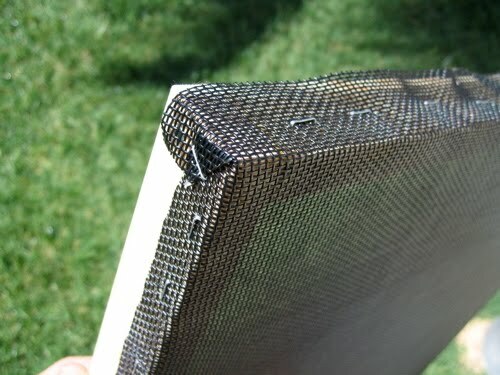 This is the same technique painters use when stretching canvas on a frame. It also works best if you have help to pull while you staple (thanks Michelle). Building four trays and screening three of them for the latest harvest took under two hours. 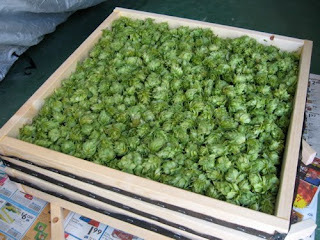 After, it was a matter of dumping hops in the trays, spreading them out, stacking, and applying the box fan. Hops dump easily into the hop oast trays. While the heavily loaded top tray dehydrated in less than 48 hours, I plan to add two more trays (for a total of 6) to decrease the density of hops per tray, encouraging a more effective flow of air. Hop oast trays stacked easily. Similar to Alton Brown's dehydrator, the trays are stacked and a box fan is used to keep air flowing around the hops. From now on, I will dehydrate my hops in the garage considering that its a dry warm environment and away from our usable living space in our house. 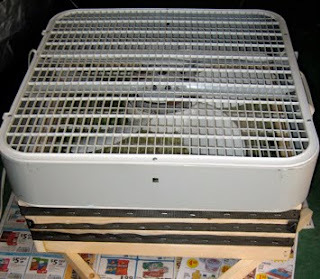 Box fan blows air down through the oast trays. Dehydrated hops are light and papery. 36 hours later, I opened the garage door with aromas of chinook and centennial pouring out. The hops are light and paper-like, ready for long-term storage prep by vacuum sealing and freezing. 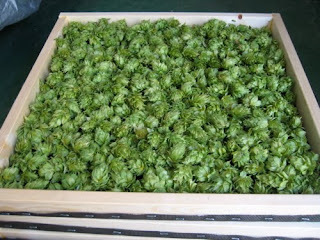 The trays are very easy to carry the hops to the kitchen and to shake clean. If you need a cheap and simple system to dry a decent volume of homegrown hops, this is working out very well for me. Let me know if you have any comments or questions! Cheers. Bishop, Rob. Sissinghurst Oast House. Digital image. Geograph, Sissinghurst Oast House. Geograph Britain and Ireland, 18 Feb. 2006. Web. 12 Aug. 2010. . When I was reading I actually started laughing. One, if I bought all those hops into the house my brewing career is over. The wife is not a hop-head more of a vanilla-honey gal. And second, I really wonder if your neighbors think there is some serious illegal activity going on. But I'm still jealous of those problems. I want to live in an IPA! Do you ever get your hops tested? I can send you a brochure. We are looking over the web for people to send our flyer and offer our service. Let me know if you are interested. Will.harrison@hopunion.com.